A unique guitarist from the young New York scene plays funky, angular music with a sextet grounded in tuba and reeds. Originality in jazz is elusive. The vocabulary of improvising on the chords to "I Got Rhythm" narrowed down to a set of rules (or clichés) years ago. To be different, but still artistic requires the imagination of recombination and recontextualization. A couple of crazy notes and a cool wardrobe just won't cut it anymore. 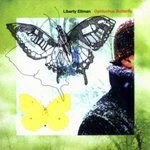 Liberty Ellman is a guitarist associated with the best of the creative jazz scene in New York today -- he's played with and for musicians like Henry Threadgill, Greg Osby, Steve Coleman, Vijay Iyer, Rudresh Mahanthappa, and Jason Moran. His approach to the jazz vocabulary reflects the rhythms and groove patterns that seemed to originate with Threadgill's avant-garde sounds, and develops through the funk-laced avant sounds of Steve Coleman's "M-BASE" collective. Today, many of the young musicians working in this fertile field are recording for Pi Recordings, the small but bold label that is home to Ophiuchus Butterfly. (Note: My curiosity got the best of me, and I looked up the word Ophiuchus. It's the only one of the 13 zodiacal constellations not to represent an astrological sign. It is said to be a figure of a man supporting a serpent. What this all has to do with butterflies is beyond me). The band Mr. Ellman has assembled for this, his third release, is a busy sextet that should remind some jazz fans of the band that Arthur Blythe put together for his fantastic Columbia album, Lenox Avenue Breakdown: two reeds, guitar, tuba, bass and drums. As with Lenox, the tubist (here, Jose Davila) locks down the bottom of the groove with exciting results. On "Tarmacadam", Mr. Davila creates a powerful funk, allowing Gerald Cleaver's drums to play all around the groove in accents and counter-rhythms. The result is a powerfully danceable sound that rescues the proceedings from being alienating or overly harsh. On other tunes ("Looking Up", for example), the tuba shifts between rhythm section playing and joining the front line, leaving the thump to Stephan Crump's acoustic bass. The front line consists of the leader's guitar (usually playing single-note melodies), Steve Lehman's alto sax, and Mark Shim on tenor. Ellman does not dominate the sound of the band, often playing in unison with one of the horns, which seem most likely to interlock in contrapuntal sparring from bar to bar. As a result, even when the tunes are in an even and clear time signature, there is a density to the arrangement that makes the sextet sound like a town square full of jabbering neighbors. "Chromos" is played in a rocking version of 12/8 time, but is webbed and complex enough to allow your ears to get lost amidst a truly impressive collective improvisation. Ellman's guitar is amplified gently throughout, though without the fat/round tone that is perfectly typical in jazz guitarland. On "Aestivation", a slow and abstract ballad, the guitar plays the lead from the start, but the peaceful guitar sound is balanced by a vinegary tone with just enough treble to help it cut through the band. Ellman's note choice is similarly incisive here: no extra notes, and every one of them is interesting. A couple of songs step beyond the M-BASE model of jagged melodies/stutter funk grooves. In addition to a conventional ballad, we find an experiment in texture, "Snow Lips", with Ellman manning a synthesizer/sampler. Similarly, "Pretty Words, Like Blades" sets up a slow-developing texture of percussion and lets it play out over time, eventually adding repeated lines from each of the instruments in an interlocking pattern akin to classical minimalism ... a grooving minimalism it is. While there are a range of approaches on these songs, the layers of sound do not leave much room for the cry of strong emotion in the individual playing. Shim, and particularly Lehman, generate some heat at times, but mostly the record feels more thought-out than felt. It's so well thought-out though, that this criticism is somewhat muted, but particularly the leader seems to have an approach to improvising that is consciously chill. Ellman's rhythms and phrasing sound like no other guitarist, and when he gets a serpentine line flowing from this axe, it can be thrilling; thrilling like an elegant solution to a problem rather than a great story. On Ophiuchus Butterfly the excitement is in your sense that you are experiencing something fresh and new -- but not that you're tumbling along on an inevitable ride. That said, Mr. Ellman stands among a precious few as a thoughtful avant-garde guitarist who is an active part of a dynamic New York jazz scene. Ophiuchus Butterfly is reserved in its solo statements, but exuberant in its rhythms and construction. The musician (and his label, Pi) deserves our full-bodied support. With music this intriguing as the end result, it's not hard to find a passion -- even if you wish the music had a dash more of it.